04 - Natural Selection 04-11 - Divergence of Character 160 In a large genus it is probable that more than one species would vary. After fourteen thousand generations, six new species, marked by the letters n14 to z14, are supposed to have been produced. In any genus, the species which are already very different in character from each other, will generally tend to produce the greatest number of modified descendants; for these will have the best chance of seizing on new and widely different places in the polity of nature: hence in the diagram I have chosen the extreme species (A), and the nearly extreme species (I), as those which have largely varied, and have given rise to new varieties and species. 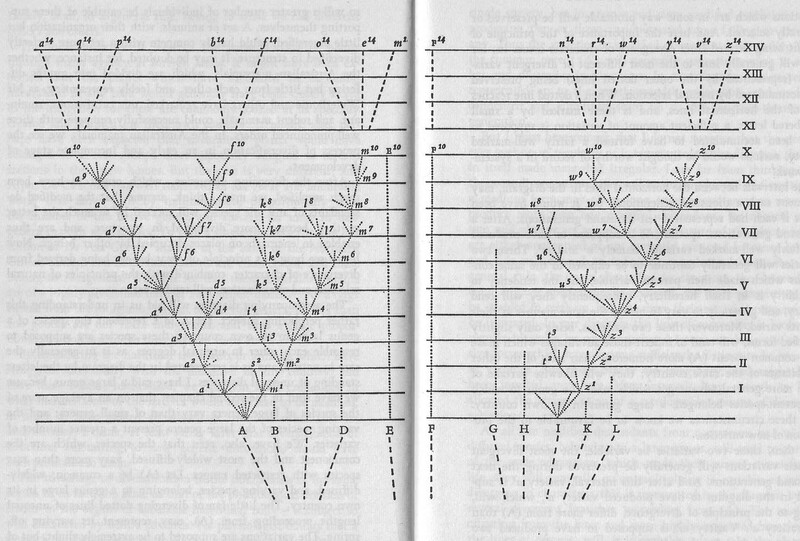 The other nine species (marked by capital letters) of our original genus, may for long but unequal periods continue to transmit unaltered descendants; and this is shown in the diagram by the dotted lines unequally prolonged upwards. 04 - Natural Selection 04-11 - Divergence of Character 170 But during the process of modification, represented in the diagram, another of our principles, namely that of extinction, will have played an important part. As in each fully stocked country natural selection necessarily acts by the selected form having some advantage in the struggle for life over other forms, there will be a constant tendency in the improved descendants of any one species to supplant and exterminate in each stage of descent their predecessors and their original progenitor. For it should be remembered that the competition will generally be most severe between those forms which are most nearly related to each other in habits, constitution, and structure. Hence all the intermediate forms between the earlier and later states, that is between the less and more improved states of the same species, as well as the original parent-species itself, will generally tend to become extinct. So it probably will be with many whole collateral lines of descent, which will be conquered by later and improved lines. If, however, the modified offspring of a species get into some distinct country, or become quickly adapted to some quite new station, in which offspring and progenitor do not come into competition, both may continue to exist.